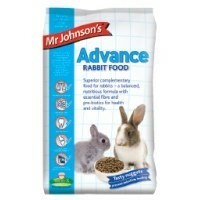 Mr Johnson's Advance Rabbit Food is a superior, mono-component nugget food for rabbits that has been enhanced with Verm-X to support overal good health. Made in nugget form to prevent selective feeding, this delicious food has a balanced and nutritious formula with added pre-biotics to promote a healthy gut and digestion. Mr Johnson's Advance Rabbit Food also contains additional yucca extract which reduces urinal ammonia and helps to eliminate hutch odours.